Suplemon is a free open source powerful console text editor with multi cursor support for linux system. It comes with syntax highlighting, autocomplete, Undo/Redo, Copy & Paste with multi line support. You can also open multiple files in tabs. And you can easily jumping to files and lines in your console like terminal. Some other features are custom keyboard shortcuts suppory, mouse support and Extensions support. 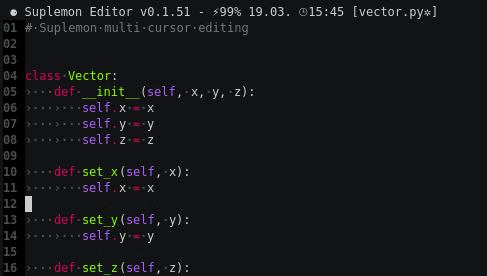 You can also restores cursor and scroll positions when reopenning files in Suplemon Text Editor. There are two options available to install Suplemon Text Editor on ubuntu. you can install it via PIP or directly from repo. If you dont have PIP, first install it via below command. Then type the below command in terminal and hit enter to install Suplemon Text Editor. You can also install it by cloning the repo.